Truck driving is a career choice that requires a lot of time on the road. It’s directly related to improving consumerism, and therefore crucial to the U.S. economy. The entire industry revolves around transporting goods from one place to another, with a lot of emphasis on time. But that doesn’t mean the job has to be dangerous. Every driver is aware of the different rules and regulations on the road, but seasoned vets and rookies alike need reminders regarding best practices to ensure driver safety. As the controller of the truck, it’s up to you to make smart decisions while driving. More than likely, you aren’t the only driver on the road and working as a team will help everyone get where they need to safely. In the case of heavy rain and winds, reduce your speed considerably. In fact, the Federal Motor Carrier Safety Administration (FMCSA) recommends reducing speeds as much as 1/3 in wet weather and 1/2 in snow. Other cars sharing the road with you aren’t always paying attention, but slowing down will force them to move around you. If you have to overtake another truck, radio the driver before. Working together in the manner reduces the element of surprise and allows both vehicles to transfer safely. Most truck drivers are often driving routes that take them through new cities or towns. Roads are unfamiliar, and while it might seem a good idea to utilize a navigation system, but you’ll want to plan your route in advance. By doing so, you not only ensure safety, but you’ll have the opportunity to keep to your schedule. Each state has different regulations about weight limits and route restrictions. Failure to understand and comply with these rules could result in thousands of dollars in fines and slow you down if you are pulled over. A report stated, 22% of accidents in large trucks occurred when the driver was unfamiliar with the road and route, so if you miss a turn don’t change lanes suddenly. Indicate your intentions and use the exit that makes it easy and safe to turn around. Following too closely can pertain to the truck driver and a passenger car. Larger semi-trucks need additional space between different cars and trucks to allow for safe breaking. For driving speeds below 40 mph, there should be at least 4 seconds between you and the leading vehicle. For speeds over 40 mph, you should give the car in front a 5-6 second-leading time. Failure to do so will result in an unnecessary accident. However, braking distance is significantly affected by the conditions of the road. In weather conditions like heavy rain, snow, or ice, you’ll not only want to reduce speed but allow for additional brake room between yourself and the lead car. Almost 5% of crashes reported were caused by a commercial vehicle following the lead car too closely, but there are some instances when passenger vehicles are following you too closely. Take any opportunity to move safely around the car or switch lanes if possible. While you can’t stop others from interacting with your truck this closely, exercise caution before changing lanes or making turns. Commercial vehicles are subject to state and federal safety regulations that comply with the rules set forth by the Federal Motor Carrier Safety Administration. These compliance checks are put in place to ensure loads aren’t too heavy, and the vehicles are operating appropriately for the driver’s safety. For any driver working with a fleet, these maintenance checks and upkeep of the truck are the responsibility of their parent company. But, roadside inspections can happen randomly, any day of the year. If you notice issues like a broken headlight, you’ll want to radio dispatch as soon as possible. They can help arrange for repairs. While regular inspection of the truck will help keep your CSA score healthy, it will also ensure your vehicle is in good working order to reduce potential accidents. Almost 40% of speeding-related fatalities occur on curves. The posted signs with speed limits are reserved for passenger cars. Large trucks need to reduce their speed even further to reduce the chance of an accident. Start by slowing down before entering a curve. Breaking while you are turning can cause the wheels to lock up, and the vehicle could start skidding. Due to the higher center of gravity, it’s easier for trucks to lose control, vigilance while entering a curve is the only way to reduce the chances of an accident. Do you have what it takes to become a truck driver? 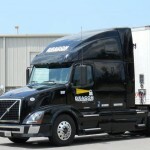 Contact Beacon Transportation today to become a part of the next generation of drivers.